Over a year ago, I had a brief post here pointing out Gene Weingarten‘s article in the Washington Post entitled “Pearls before breakfast“, in which the Post asked the question of what would happen if a world-class musician (in this case, Joshua Bell), were to perform incognito and out of context, in a Washington subway during the morning rush hour? If you haven’t yet read the article describing the experiment and the outcome, I recommend it to you. Anyway, a few weeks ago, this article was awarded the 2008 Pulitzer Prize for Feature Writing. Congratulations to Gene, Joshua, and the other Washington Post staff! I usually try to keep political issues out of this blog, and I certainly try to avoid asking friends and readers of this blog for favours, but there is an urgent situation developing in mathematics (and related disciplines) in my home country of Australia, and I need to ask all of you for assistance to prevent an impending disaster. When I was an undergraduate at Flinders University in South Australia from 1989 to 1992, the level of mathematics education in Australia was comparable to that of world-class institutions overseas. Even in a small and little-known university such as Flinders, I received a first-rate honours undergraduate education in mathematics, computer science, and physics which I continue to use daily in my career. (Examples of topics I learned as an undergraduate include wavelets; information theory; Lie algebras; differential geometry; nonlinear PDE; quantum mechanics; statistical mechanics; and harmonic analysis. I rely on my knowledge of all of these topics today, for instance many of them are are helpful for me in teaching my current class on the Poincaré conjecture.) In addition, several of the faculty (including the chair and my undergraduate advisor, Garth Gaudry) had the time to spare an hour a week with me to discuss mathematics, as they were not overloaded with large teaching loads and other duties. I honestly think that I would not be where I am today without the high-quality undergraduate education that I received (in particular, I would definitely have floundered in graduate school at Princeton, if I were admitted at all). 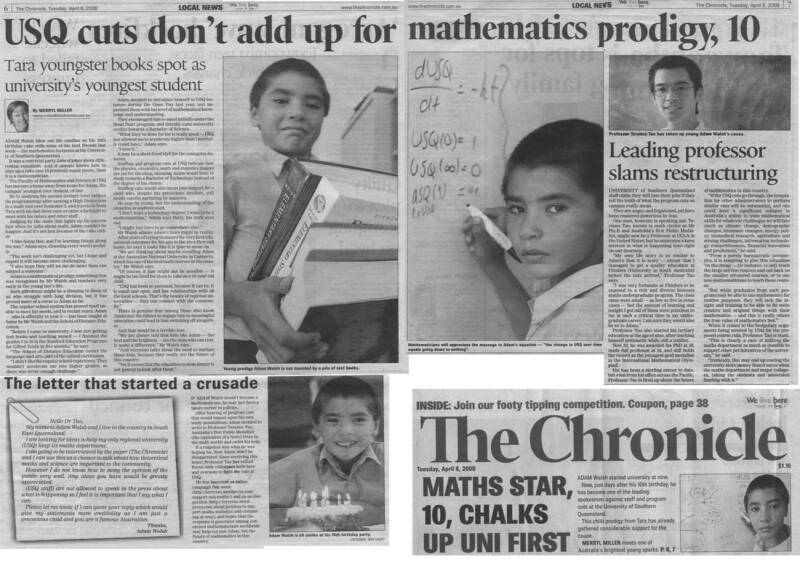 The situation for mathematics education in Australia began however to deteriorate in later years, due to a combination of factors including government neglect (the federal government is the most significant source of funding for most universities in Australia) and the low priority of basic education in mathematics and sciences among university administrators. In particular, at Flinders University, the School of Mathematics suffered severe attrition due to lack of support and was eventually folded into the School of Informatics and Engineering. In fact the number of mathematicians on the faculty at Flinders has dwindled down to just three (in my day it was close to 20). The decline of mathematics departments across the country, particularly in a time in which mathematics skills are desperately needed in the workforce, has been documented thoroughly in the 2006 national strategic review of the mathematical sciences. In response to that report, the federal government in 2007 announced an increase in the funding allocation to universities based on their student enrollments in key majors including mathematics and the sciences. The newly elected federal government is also likely to continue and extend this support in its upcoming budget in May of this year. Unfortunately, it appears that at many universities, the additional funding was diverted away from the schools that it was intended to support, for the administrator’s own priorities. (See also the letter by the international authors of the above mentioned review, Jean-Pierre Bourguignon, Brenda Dietrich, and Iain Johnstone, condemning this diversion.) As a consequence, many mathematics departments are in fact in worse shape than before. There is a particular crisis unfolding at the University of Southern Queensland. On March 17, the university announced a rationalisation and restructuring proposal that would cut the number of mathematics faculty from 14 to 6, eliminate the majors in mathematics, chemistry, physics, and statistics, and phase out all non-service courses (for instance, any of the types of courses I mentioned above at Flinders would be lost). Similar cuts were also proposed in statistics, computer science, and physics, although other schools retained their funding and some even obtained increases. This is despite the increases in funding from the federal government for mathematics and statistics students (enrollments in these areas at USQ has held steady so far, though of course with the proposed cuts this is unlikely to last). Already as a consequence of these proposals, initiatives of the department such as an education program for high school mathematics teachers have had to be scrapped. Somewhat ironically, the Dean of Sciences at USQ, Janet Verbyla, who has been heavily involved in proposing the cuts, had also presided over similar reductions in the school of mathematics at Flinders. If the proposed cuts at USQ go ahead, it is likely that other small universities in Australia will be tempted to similarly ignore concerns about mathematics and science education and perform similar cuts, even while receiving government support for these disciplines. (The University of New England, which currently shares some statistics courses at USQ, would for instance be particularly vulnerable.) So the crisis here is not purely localised to USQ, but could be very damaging for mathematics and sciences in Australia as a whole. that you can sign to show support, and people to contact in the university administration and in the Australian government to express your concerns, or to express support for mathematics and its role in the sciences. Please also inform others, especially those in Australia and who may have influence in media, political, or administrative circles, of the current crisis. There is still time, especially in view of the expected increase in support for mathematics and sciences in the upcoming federal budget, to reverse the situation before the damage becomes permanent, and to show that the political support for mathematics education is not so negligible as to be easily ignored. Anyway, Danica’s book has already been reviewed in several places, and there’s not much more I can add to what has been said elsewhere. I thought however that I could talk about another of Danica’s contributions to mathematics, namely her paper “Percolation and Gibbs states multiplicity for ferromagnetic Ashkin-Teller models on ” (PDF available here), joint with Brandy Winn and my colleague Lincoln Chayes. (Brandy, incidentally, was the only student in my topology class who did better than Danica; she has recently obtained a PhD in mathematics from U. Chicago, with a thesis in PDE.) This paper is noted from time to time in the above-mentioned publicity, and its main result is sometimes referred to there as the “Chayes-McKellar-Winn theorem”, but as far as I know, no serious effort has been made to explain exactly what this theorem is, or the wider context the result is placed in :-) . So I’ll give it a shot; this allows me an opportunity to talk about some beautiful topics in mathematical physics, namely statistical mechanics, spontaneous magnetisation, and percolation.